"Hail to the etc etc." Duke Nukem will return in Duke Nukem 3D: 20th Anniversary World Tour, Gearbox has just announced. 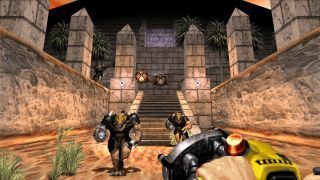 It's a new version of Duke 3D, with a toggle that will let you switch between the original "2.5D" graphics engine, and Gearbox's "all-new True3D Rendering mode", which renders the game in full 3D but that appears to keep the crunchy pixel art intact. However, you'll probably be more interested in the brand new episode—Alien World Order—which adds eight new levels created by Duke 3D's original designers, Allen Blum III and Richard “Levelord” Gray. New music from Lee Jackson—the guy who did the original's theme tune—new lines by Duke's voice actor Jon St. Jon, and an in-game commentary by the original dev team are also things to expect. It sounds like a pretty comprehensive package.